At Great Lakes Stair and Steel, we pride ourselves on the high quality of our work and our focus on superior customer service. We are renowned for our ability to work with architects, general contractors, and owners in designing and expediting stair, rail, and structural steel systems to meet your needs. 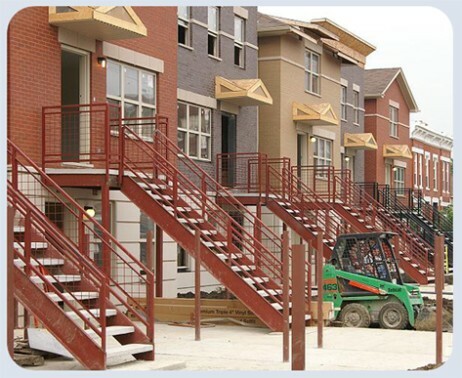 The design and installation staff at Great Lakes Stair and Steel has over two decades of real world experience behind us to overcome any obstacle. One unusual quality you will find at Great Lakes Stair and Steel is our ability to use traditional blacksmithing techniques to fabricate components for your projects. This time-honored way of thinking is carried over into all of our fabricating practices. It allows us to keep a work flow unmatched by others and create a product which is always unique. We have completed thousands of projects to date. These projects include single family residential, multi-tenant residential, restaurants, shopping centers, commercial buildings, industrial projects, and a variety of smaller and unique fabricated items. Chicago is our home and we install our products all over the city and the surrounding suburbs. Call, fax, email, or mail your project requirements to us today and we will return results immediately. If you're not sure how to get started, check out the Requesting A Bid page. !A word of Caution! : Be wary of hiring companies that broker out portions of their projects to subcontractors. We are a Full Service Shop. Click here for more information about what that means and how that unique capability works towards assuring the ultimate success of your stair or steel project. Please note we are not currently bidding residential jobs or for individuals that are not General Contractors.